MyWritingLab is not a self-paced technology and should only be purchased when required by an instructor. 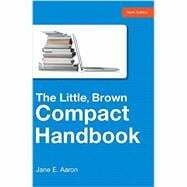 The Little, Brown Compact maintains the authority of its best-selling parent (The Little, Brown Handbook) in a briefer book with spiral binding, tabbed dividers, and over 150 exercise sets. While keeping pace with rapid changes in writing and its teaching, it offers the most comprehensive research and documentation available, with grammar coverage that is second to none. “Culture-Language” notes explore the most common issues faced by both non-native English speakers and students with dialect interference; rather than segregating this material, coverage is integrated so that students don’t feel compartmentalized. With detailed discussions of critical reading, media literacy, academic writing, and argument, as well as writing as a process, writing in the disciplines, and writing beyond the classroom, this handbook addresses writers of varying experience and in varying fields in a format that is a brief and convenient. b With both…and, not…but, etc. f Verb + participle: look up, look over, etc. a Main clauses without and, but, etc. b Main clauses with however, for example, etc. a Main clauses with and, but, etc. 2 In compound subject, predicate, etc. a Concluding explanation, series, etc. f Units of measurement, names, etc.